AFC Cable Systems MC-Stat® Lite Plus 10/3-10/3-10/1-AWG MC copper cable has steel armor to offer mechanical protection. 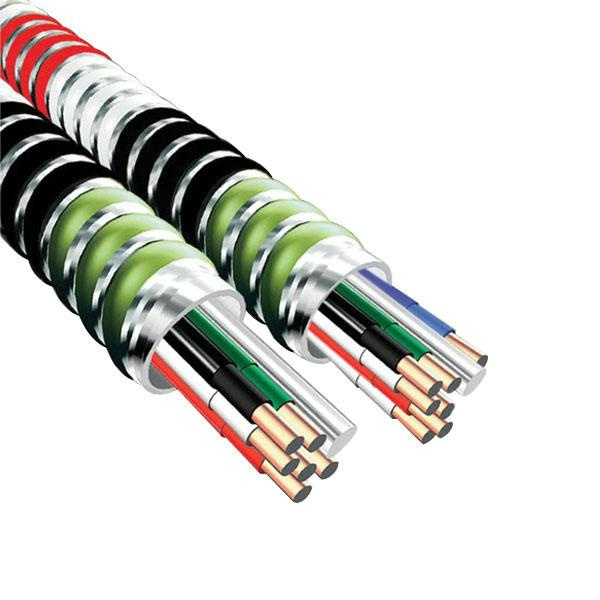 This 0.893-Inch OD cable features THHN insulation that offers protection against electrical threats. It has voltage rating of 600-Volts and 120/208-Volts. This cable has black/red/blue color-coded phase, white color-coded neutral and green ground color-coded conductors for easy user identification. It withstands dry temperature of 90 deg C. This 250-ft cable comes in coil. It is suitable for a variety of power distribution systems from lighting to devices and receptacles. Cable is UL listed, HUD/OSHA compliant and meets NEC standards.